Summary:Getting into Yale has been Kate Larson’s dream for years—and being overworked and under-rested is the price of admission. But when she opens her eyes after falling asleep on her keyboard one night, she comes face-to-face with, well, herself. Meet Kate’s computer-generated twin. Kate doesn’t know why she’s here or how to put her back where she belongs, but she’s real. And she’s the last thing Kate has time to deal with right now. Unless. . .could having a double be the answer to Kate’s prayers? 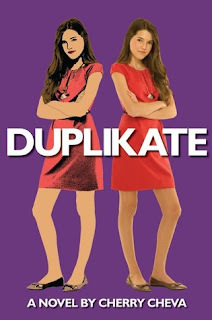 In this hilarious second novel, Cherry Cheva introduces a character who has been granted the wish of every overscheduled teen everywhere—for there to be two of her. But as everyone knows, you should be careful what you wish for...it just might come true and wear all your clothes and steal your boyfriend. My Thoughts: I didn't know what to expect starting this. I didn't know it I would like it or not. I mean, come on, face it, you don't see too many books with this plot! I liked it a lot more than Cherry's previous book, She's So Money. We are introduced to Kate who is an achievement-a-holic. She feels like she has to do everything perfect to get into the same college as her boyfriend, an IVY league school. She has a popular smart boyfriend named Paul. She never has any free time therefore she never even gets to spend much time with Paul. She falls asleep one night on her keyboard and wakes up to find a computer generated person who looks exactly like her named Rina. Oh my, its the girl from a game she played long ago! Kate starts splitting her work with Rina so she can get more done. She is teamed up with a boy named Jake for a school project. Back in the day, her and Jake used to be good friends but once she got with Paul, Jake just wasn't cool enough anymore. Kate learns she may not want everything she has been trying to do and her life needs to change. I loved the way Kate and Jake's relationship changed and I really enjoyed Rina's company. This book was a cute sassy fun read. It kept me interested and I wanted to know what happened next. Read the book to find out more about Kate and Rina. Read the book to find out if Kate gets accepted into college. And where does Rina go from there???? Overall: Loved it. Cute, fun, smart, delightful. Cover: The cover is cute. I like how it shows Kate as a person and than Kate as a computer generated image.